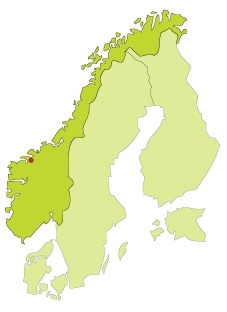 The northern part of the west coast is home of the fjords. The fjords are V-shaped valleys formed by glaciers during the last ice age. The fjords can be accessed from Oslo by coach or train and offers a magnificent landscape filled with beautiful waterfalls, steep rocks and clean blue waters. One of the most beautiful fjords is the Geiranger Fjord. It is listed on the UNESCO World Heritage List and with majestic snow-covered mountain peaks, beautiful and wild waterfalls, lush, green vegetation and deep blue waters the fjord is really the crowing glory of Norway.